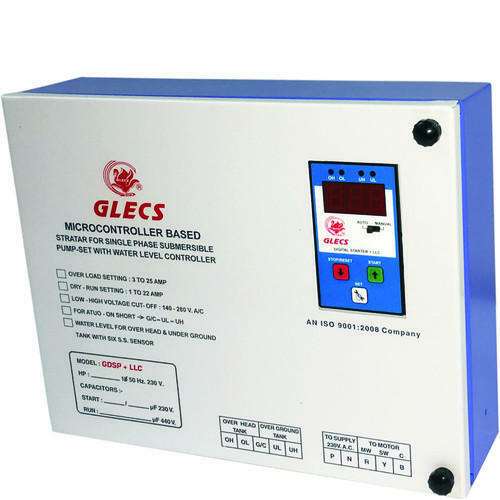 Gold Lotus Electronics (GLECS) has been enjoying its popular esteem as the leading manufacturers and suppliers of Auto Switch, Water Level Controller, Earth Leakage Circuit Breaker, Electronic Starter, Voltage Stabilizer, etc., in this part of the country since 1995 onwards because of its qualitative characters and long lasting performance requiring absolutely no after sales service. Our brand name GLECS has also been registered with the Trade Mark Registry. The fluctuating AC main supply voltage has been a grave concern of theIndustries, trades and people at large. Due to unstable AC supply even a best brandElectrical equipment miserably fails to function causing serious concern of theIndustries resulting nto a heavy loss of production whicultimately hampers its production schedule and supplies as well. GLECS products are so designed to suit the bestrequirements of the customers for its trouble free performance backed by soundTechnological up gradation of our products.